During MACâ€™s 2014 AGM in June, the Quebec Mining Association (QMA) announced that its members will adopt the Towards Sustainable Mining (TSM) initiative, a program designed to improve environmental and social practices in the Canadian mining industry, over a phased-in four-year period. MAC and its members launched the TSM initiative in 2004. This announcement marks the second provincial mining association to commit to formally implement the initiative, following the Mining Association of British Columbiaâ€™s (MABC) adoption of TSM in 2011. Quebecâ€™s new Minister for Mines, Luc Blanchette, was in attendance for the announcement in Montreal on June 17 and welcomed the news. In a press release issued by his office, Minister Blanchette commended the QMA for its adoption of TSM, indicating that it will help make the province a world leader in sustainable mining. 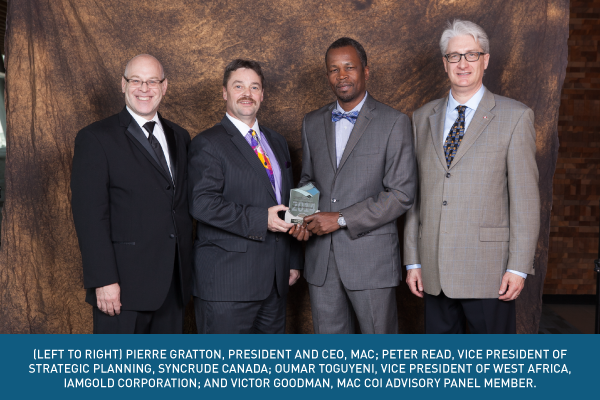 MAC commends the QMAâ€™s adoption of the TSM initiative, which reflects the Quebec mining industryâ€™s commitment to raising the bar for corporate responsibility and to provide communities with a transparent view of their performance in critical environmental and social practices. 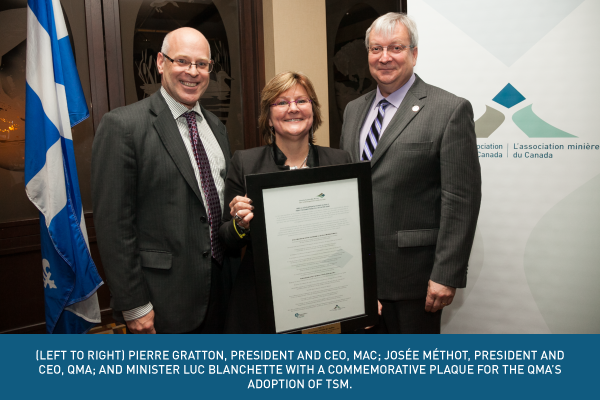 This is a milestone for the TSM initiative, helping to expand its reach within Canada and adds to its credibility as an effective mining standard. MAC members operating in Quebec already report their performance annually. In 2014, the TSM initiative is celebrating 10 years of driving performance for mining operations across Canada and beyond. TSM has been successful in pushing for continuous progress in the mining sector as evidenced by the results that have seen steady improvement over the duration of the program. For a detailed look at facility-level results of participating mining companies, download the latest TSM Progress Report here. Quebec has become the first province to publicly support the federal government in its efforts to promote transparent and responsible resource revenue management. The announcement represents a significant step forward in aligning Canadian disclosure standards with those in the US and EU. In its June 4 budget, the Government of Quebec committed to working with the AutoritÃ© des marches financiers to implement the initiative in the province. Quebecâ€™s announcement follows a Canadian government commitment to enhance extractive sector payment transparency, announced by Prime Minister Stephen Harper in the June 2013 run-up to the G8 Summit. This announcement was celebrated by the Resource Revenue Transparency Working Group (RRTWG)â€”comprised of MAC, the PDAC, Publish What You Pay-Canada and the Natural Resource Governance Institute (formerly the Revenue Watch Institute)â€”which is promoting the implementation of payment disclosure through provincial securities regulators. The Working Group developed and finalized recommendations for Canadaâ€™s mining sector on the reporting of payments to governments in January 2014. These recommendations are the result of more than a year of multi-stakeholder consultations across Canada, and take into account expert guidance and a substantial public comment process. The RRTWG would like to acknowledge and thank the Quebec Mining Association, in particular the QMAâ€™s President and CEO, Ms. JosÃ©e MÃ©thot, for her efforts in support of the RRTWG, and Quebec civil society, who have been actively promoting increased transparency in the resource sector. Government implementation of the RRTWG recommendations would help provide citizens around the world with valuable information about payments from companies to governments in countries that produce minerals. Increased transparency will allow citizens and media to hold their governments to account for the revenues generated from mining activities and will help to ensure that these revenues contribute to sustainable development and poverty reduction. For example, the Africa Progress Panel stated that Africa is home to 30 percent of the worldâ€™s mineral reserves, yet resource-rich African states still lag in almost all development indicators. Enhanced payment transparency is critical to ensuring that governments mobilize natural resource revenues to fight poverty and promote development. For the full text of the recommendations, visit our website. 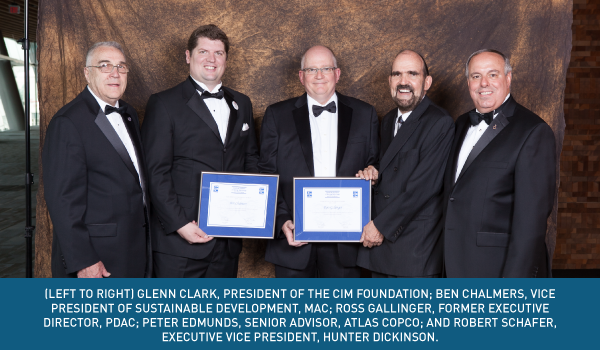 For their work pushing for greater resource revenue transparency within the Canadian mining industry, Ben Chalmers, MACâ€™s Vice President of Sustainability, and Ross Gallinger, former Executive Director at the Prospectors & Developers Association of Canada (PDAC), were recognized as CIM Distinguished Lecturers at the CIM Awards Gala in Vancouver in May. MAC and the PDACâ€™s groundbreaking collaboration with Publish What You Pay-Canada and the Natural Resource Governance Institute (formerly the Revenue Watch Institute) â€“ in whatâ€™s known as the Resource Revenue Transparency Working Group â€“ was highlighted for its success in cultivating broad support from the mining sector and from civil society to bring Canada in line with the global transparency effort. CIM Distinguished Lecturers are chosen on the basis of their accomplishments in scientific, technical, management or educational activities related to the minerals industry. Four MAC members, Suncor Energy Inc., Teck Resources Limited, IAMGOLD Corporation, and New Gold, have made the sixth annual Top 50 Socially Responsible Companies list, produced by Macleanâ€™s Magazine and Sustainalytics. Companies are evaluated by Sustainalyticsâ€”a global leader in sustainability analysisâ€”on their performance across a broad range of environmental, social and governance indicators. Suncor was recognized for its investment of $1.3 billion in developing and implementing a new tailings-reclamation management process. This innovation allows the company to dry mine tailings into a soil-like deposit that can then be re-vegetated, ultimately helping to speed the pace of land reclamation. Suncor was also recognized for its commitment to promoting best environmental practices within the boreal zone as evidenced by its boreal-forest action plan, its membership in the Boreal Leadership Council and as a signatory to the Boreal Forest Conservation Framework. Teck Resources was acknowledged for embedding its core sustainability principles throughout the company by integrating social and environmental considerations into their employeesâ€™ training programs and goal-setting initiatives. Teckâ€™s mine smelter in Trail, BC was also recognized for recycling electronic waste such as batteries and televisions, and reusing the gas produced from the waste for fuel. IAMGOLDâ€™s work with communities internationally was highlighted, and its strong community consultation and human rights programs were commended in Sustainalyticsâ€™ analysis. 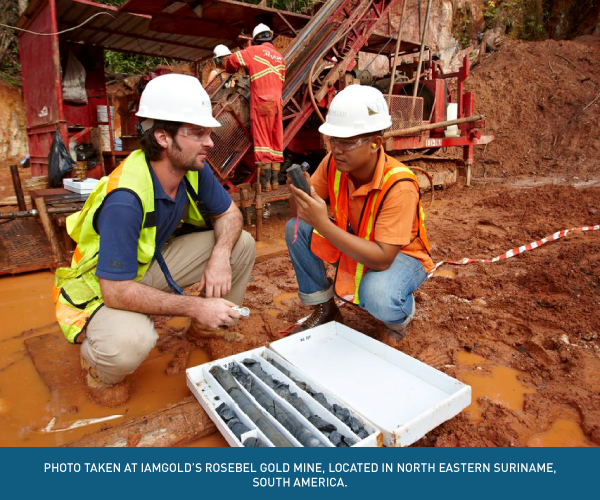 IAMGOLDâ€™s Rosebel mine in Suriname was called out for its practice of engaging community members to participate in environmental monitoring processes at the site. As part of the program, two local representatives assist in quarterly environmental assessments to identify non-compliance and corrective actions. New Gold was recognized for its environmental achievements, and for its engagement with and employment of Aboriginal peoples. At its sites, no water is discharged to the surrounding environment as all of New Goldâ€™s mines operate in a closed circuit. This allowed the company to recycle 27.3 million cubic metres of water in 2012â€”almost five times the amount of raw water that the company withdrew from natural sources. New Goldâ€™s exploration agreements with First Nations communities, and its strong employment record of Aboriginal people were also highlighted. At its New Afton mine and its Blackwater project, New Goldâ€™s workforce is almost one-quarter Aboriginal. For their innovative projects that raise the bar for corporate responsibility in the Canadian mining sector, Syncrude Canada and IAMGOLD Corporation were recognized with inaugural TSM Awards at the Canadian Institute of Mining, Metallurgy and Petroleum (CIM) Awards Gala in Vancouver in May. In the Sahel region of Burkina Faso, home to IAMGOLDâ€™s Essakane gold mine, the climate is desert-like, often reaching 45 ÌŠ C with very little rainfall. Populations largely rely on livestock breeding and gold mining for their livelihoods. To improve security and combat poverty in the region, IAMGOLD committed to develop alternate revenue sources for communities living near the mine site. Working with communities of interest, market gardening emerged as an opportunity to broaden revenue sources, while at the same time improve food security and nutrition. In 2009, 100 women from the relocated 500-member Marganta community adopted the practice using a solar-powered well and water storage system provided by IAMGOLD. This innovation has greatly lightened the womenâ€™s workload and has allowed them to water garden beds without worrying about a lack of water. Two years later, drip irrigation technology was added, which has helped increase production without increasing water use. Vegetables can now be cultivated year-round, increasing the number of harvests to two to three per year instead of just one. A total of 25 nominations were submitted by mining companies that participate in the TSM initiative. The selection committee, comprised of members from MACâ€™s independent national community of interest (i.e. stakeholder) advisory panel, selected the finalists based on criteria such as innovation, involvement of and engagement with communities, and project outcomes. TSM performance was also considered as an indicator of the companyâ€™s ongoing commitment to corporate responsibility. For more information about TSM or about the TSM Awards, visit our website.